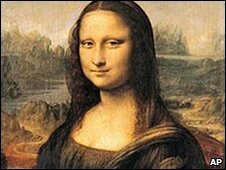 BBC News - The medical secret behind Mona Lisa's smile? For centuries, art historians have been troubled by Mona Lisa's enigmatic smile - but, according to one doctor, her cholesterol levels were more worrying. For Dr Vito Franco, from Palermo University, she shows clear signs of a build-up of fatty acids under the skin, caused by too much cholesterol. He also suggests there seems to be a lipoma, or benign fatty-tissue tumour, in her right eye. Dr Franco says his medical examinations reveal more than artistic viewings. "Illness exists within the body, it does not have a metaphysical or supernatural dimension," Dr Franco told La Stampa newspaper. "The people depicted in art reveal their physicality, tell us of their vulnerable humanity, regardless of the artist's awareness of it," he added. The professor of pathological anatomy at Palermo University presented his finding at a medical conference in Florence. Leonardo Da Vinci's 16th Century portrait was not the only work of art to receive the professor's medical diagnosis. He also suggests the delicate elongated fingers in Botticelli's Portrait of a Youth reveal the boy was perhaps suffering from Marfan syndrome, a genetic disorder that affects connective tissues. Dr Franco has even diagnosed the artist Michelangelo himself - depicted in Raphael's The School of Athens. He says his swollen knees in the painting appear to indicate excessive uric acid and he could have been suffering from renal calculosis.